When visiting the de Young Museum, one may travel to an assortment of distinct lands without having to step foot on an airplane. Thousands of artifacts and international talent are on display that paints a picture of worldwide proportions. 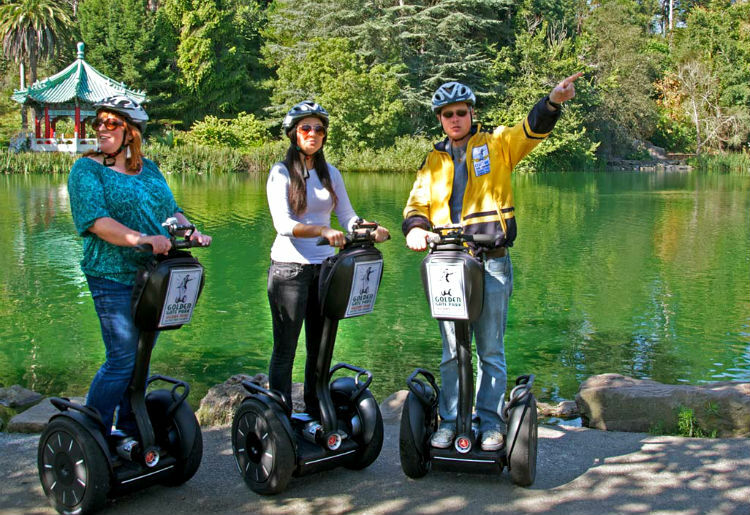 Besides art and culture, there are an additional variety of elements associated with paying a visit to this stimulating Golden Gate Park attraction. A café, sculpture garden, and easy access to a Japanese tea garden are just some of the features to look forward to. Before entering the de Young Museum, there are two main access points to consider. The first comes in the form of the Music Concourse Garage, which holds 400 cars. For the low price of $5 per hour during the week and $6 per hour on the weekends, guests may cross into the museum through a simple tunnel walk from Fulton Street and 10th Avenue. Special event parking after 5:30 p.m. costs a flat rate of $17. When choosing to park somewhere else, a rather large inviting entrance is situated on Tea Garden Drive. Additional parking is found at the UCSF Medical Center Garage (Irving Street near 3rd Avenue) for the cost of $3 per hour, with a maximum fee of $24. The original de Young Museum opened to the community in 1921, which served as part of the 1894 California Midwinter International Exposition. Named after the early San Francisco newspaper personality, M. H. de Young, this enlightening attraction is almost always called by the shortened “de Young” reference. To accommodate a growing art collection and repair damage sustained after the Loma Prieta earthquake, the fine arts museum underwent a rebuilding phase, where it reopened to the public in 2005. One of the most significant changes that set the old de Young Museum aside from the new version not only includes the size of the building, but also offers the environmentally conscious concept of giving back more green to the surrounding environment. 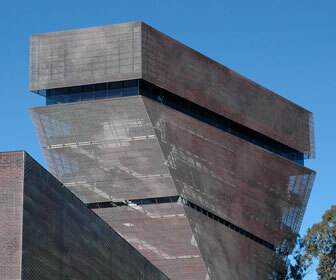 The old de Young Museum measured 140,000 square feet, while the newer building showcases 292,000 square feet. 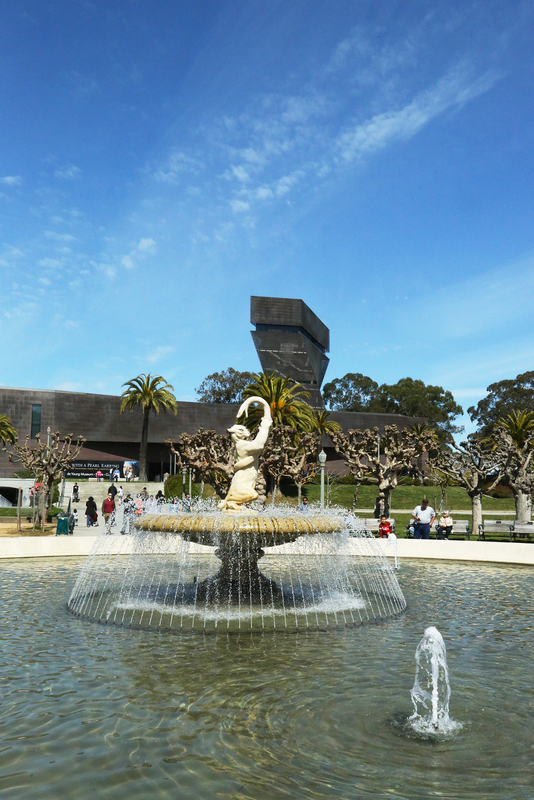 Although the new de Young displays a larger gallery area and a taller tower, a decrease of the overall building footprint took place, creating 88,00 square feet of green space that was returned to the park. Original elements of the historic de Young building also still remain, including the Pool of Enchantment, sphinx sculptures, and the initial palm trees planted about the landscape. Original ferns, redwood and sandstone still survive. Inside, an expansion of building features and visitor amenities offer an open and engaging space perfect for productive sessions of creative exploration. a) Check Out the Permanent Collection: The new de Young Museum offers a satisfying range of permanently collected items, which hails from many different parts of the world. Spread across the first and second floors of the museum, visitors will encounter African, Oceanic, New Guinea, and American Indian art objects. b) Purchase a Souvenir: Found on two levels of the museum, the de Young Store offers entrances on both the lower Exhibition Level, and the main Concourse Level. Some of the items on the main floor awaiting your arrival include unique art objects, custom-made jewelry, international textiles, and home furnishings. The lower level store is where art books, children’s toys, posters, and stationery are situated. If you like a particular painting at the museum, this is the place to seek out for items related to such works of art, such as a key chain, postcard, or print. c) Pass Through the Sculpture Garden: A host of contemporary artist works of art are scattered about the Barbro Osher Sculpture Garden, which presents the perfect opportunity to capture a nice collection of photographs. d) Check Out the View: When you reach the Hamon Tower Observation Floor, which is located on the east end of the museum, you will find yourself 144 feet in the air. 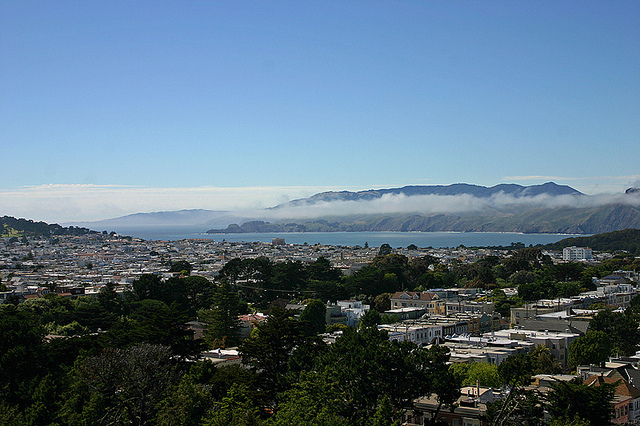 This feature of the de Young offers some of the best panoramic views of the city. Impressive views of Golden Gate Park, San Francisco neighborhoods, and the Golden Gate Bridge are all free to enjoy when the museum is open. e) Grab a Bite to Eat: To satisfy a grumbling tummy, the de Young Café offers tasty seasonal treats prepared with some of the freshest local ingredients. Following the “Farm to Fork” program, your meal is arranged using cheeses, dairy, bread, fruits, vegetables, and meat grown or produced no more than 150 miles from the kitchen. f) Plan a Special Event: The de Young Café, Terrace, Barbro Osher Sculpture Garden, and Piazzoni Mural Room have been rented out for an assortment of wedding events, corporate get-togethers, and other special gatherings. Prices to enjoy this luxury depend which section of the museum you desire to rent. 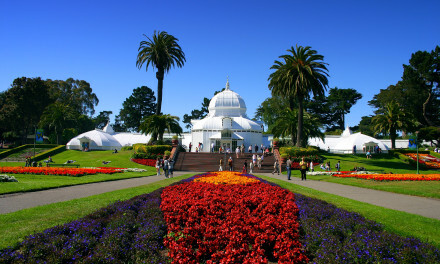 Address: The de Young Museum is located at 50 Hagiwara Tea Garden Drive, which can be found within the Golden Gate Park. Museum Hours: The museum is open from 9:30 a.m. to 5:15 p.m. on Tuesday through Sunday, and closes at 8:45 p.m. when special events are planned for Fridays. Closed Thanksgiving Day and Christmas Day. Admission: The museum entry fee is as follows: (Adults; $15), (Seniors 65 and over; $12), and (College Students with ID; $6). 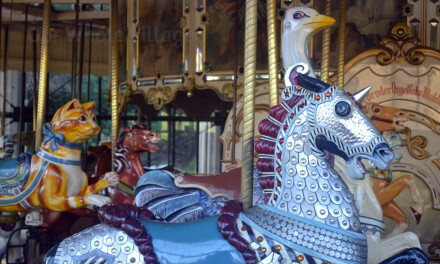 There is free admission for children 17 and younger, as well as Members. 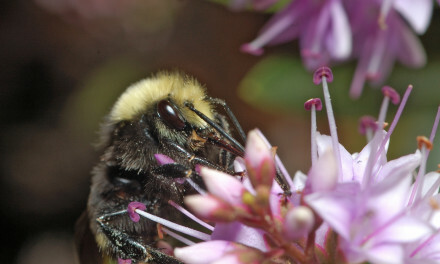 There is also no fee charged for visiting the museum courtyard, cafe, store, sculpture garden or tower. 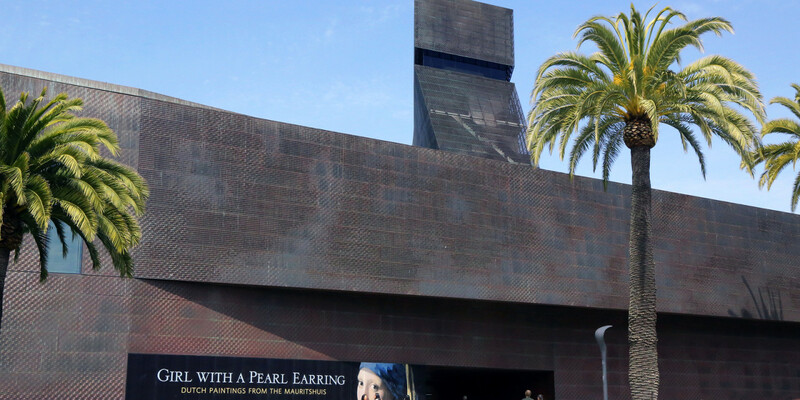 Interesting Fact: The de Young Museum façade consists of 950,000 lbs of copper, 300,000 lbs of glass, as well as 7,200 distinguishingly designed copper panels with 1,500,000 embossings.